The wildflower meadow is coming to the end of its summer. The flower heads are turning brown, but are still, I think, rather beautiful. They give height and texture to the meadow, gently cascading down the slopes beyond the south lawns towards the Park. There is a broad, winding mown path running though the meadow diagonally for visitors to enjoy. Just walk quietly, listen out for all the noises of the insects – it is so busy and an extraordinary testament to the flower meadow’s success. It is also a haven for Mike Withers’ bees and gives them late autumn nectar for their winter sustenance. We began to create this area over ten years ago, taking time to harrow the ground for two years to break up the existing grass so that the wild flower seeds could establish themselves with less “aggressive” competition. 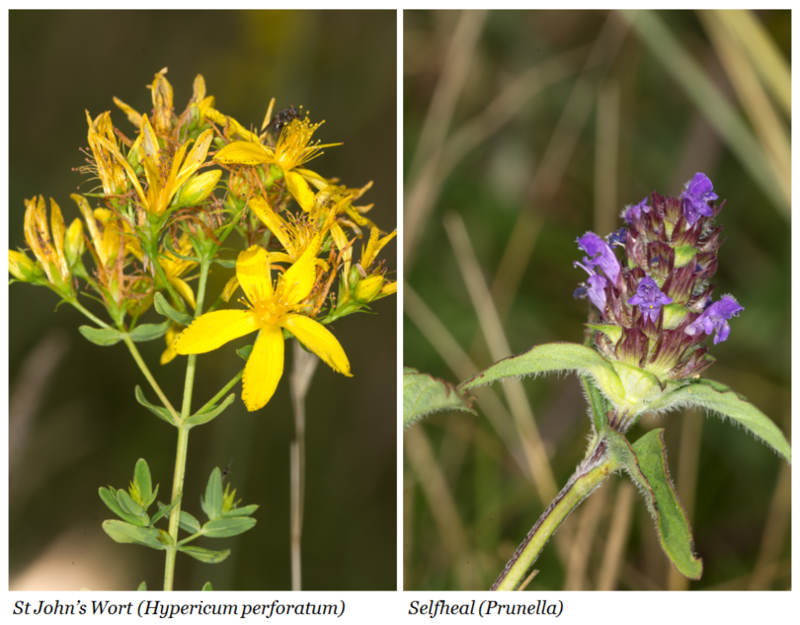 The mixes of seeds chosen were geared towards traditional Hampshire chalk grassland species and, over the years, it has developed, changing in colour and deepening in variety. In about six weeks we will harvest the seeds (which we package to sell), before cutting and removing the hay to maintain the low fertility on the area which is vital for the wild flowers. 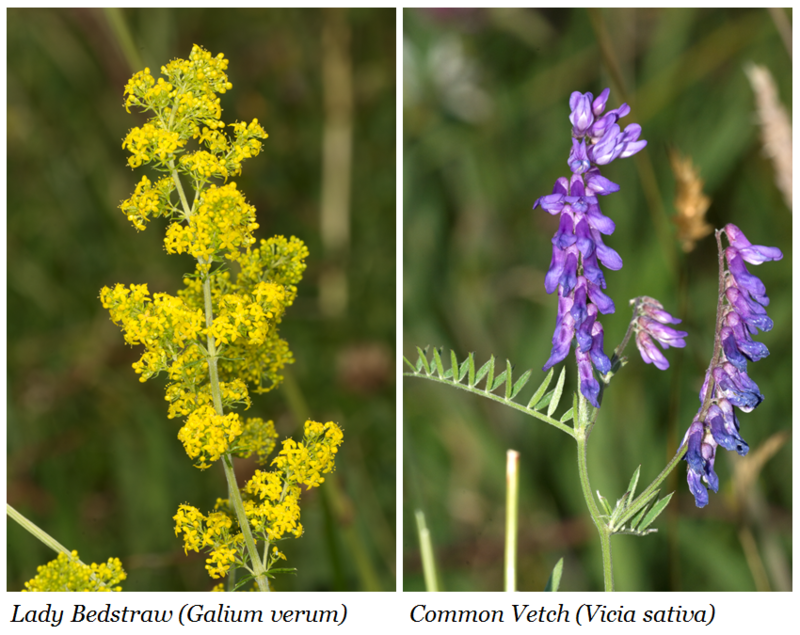 The photos above show some of the diversity from Field Scabious, Bird’s Foot Trefoil, Harebell, Vetch, Eyebright, and Milkwort. These are names and plants that recall earlier medicinal purposes. For example, scabious (scabies) seemed to help with healing boils and skin maladies – much needed in this area during the plague years, although unfortunately over 30% of the population died without being able to treat their lesions. Selfheal (applied to wounds to promote healing), whilst Lady Bedstraw repels fleas in mattresses as well as giving a yellow dye which was used to colour cheese such as Double Gloucester. Common vetch, for example, has been used for fattening cattle or perhaps as part of an early diet for people. The Downton Abbey film crew always hoped it would come into its own early so that they could film picturesque scenes of the ladies with parasols walking through it. I, on the other hand, really enjoy riding through it on my Arab mare who, whilst she is growing older and more responsible, begins to dance and think it is just to place to spin round and gather some speed up the slope back home. The picture below shows Sheila the sheep out for walk too, infinitely better behaved and more willing to walk to heel than the dogs tend to be. There are undoubtedly good moments in life, and often the simplest ones are the most satisfying. I enjoyed that meadow in early May when it was blooming with cowslips. It was lovely then. Thank you for your work and making such delights available to the public eye. I am recalling my June visit, but with regrets I didn’t walk that meadow. Next time! Your essays provide beautiful respite in a difficult world. Thank you. Thank you so much for your great stewardship and for sharing so many delights. I’m going to be there tomorrow and I am so looking forward to it. What a lovely read this Monday morning. We are currently putting life back together after horrific flooding over last week. Looking at your pictures and descriptions of the beautiful scenery was a much needed boost this morning. A pleasant reminder that beauty remains in the midst of chaos. Sending best wishes from Texas! So delighted to see your dogs, Arabian mare, and Sheila the sheep on their perambulation. They have such personality in their faces, such ownership of you, their human. Which book does the A.A. Milne quote come from? He was the first author read to me as a baby by my mother. Winnie the Pooh, and his poetry (Now We Are Six ?). Good King John and his India rubber ball. Milne’s phrasing made me laugh, so charming it sounded. Very interesting that a wildflower meadow must be choked down in fertility in order for the flowers to grow. Why is this so? Nature always surprises us, don’t you think? 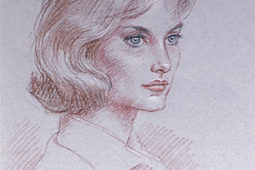 As always, thank you for sharing your Highclere world with us. Regards to you, Lord Carnarvon, your son, animals, and castle staff. Thank you – I love AA Milne and Winnie the Pooh, my last book began with a quote from him … it is amazing where flowers can grow. We now have wild flower headlands around fields too. It is a good way to farm. Greetings! Thank you for adding to the beauty of this world. I have heard, along the way, ” stop and smell the roses” …. we need to pause once in a while, take a deep breath, and notice the simple splendors around us. So easy to miss out on in our busy lives. I have happy memories of walking that path through the beautiful meadow. The view to the Castle is breathtaking, and although I was there twice in early Spring, the meadow had Queen Anne’s Lace, Field Scabious (which I thought was clover), and many other wonderful wildflowers. I agree that it is important to enjoy the life that sustains itself through the blooming season, and listening to their individuals sounds. It is peaceful and rewarding. I LOVE that one of your sheep walks with you and the dogs! I don’t know why, but I adore sheep and find it interesting that she behaves like a “pet”. The meadow will look lovely when the first frost appears. Enjoy the last few days of summer. Thank you for sharing more insights and photos of life around the Castle! Thank you Lady Carnarvon, for a wonderful description of the meadow, on this miserable dull day in Yorkshire, reading the blog, brought a ray of sunshine, as I imagined walking through the meadow on a lovely sunny day. Thank you. Lorraine. It has been a bit grey here today although I have been swamped by work so maybe that was fine! I adore wildflowers! 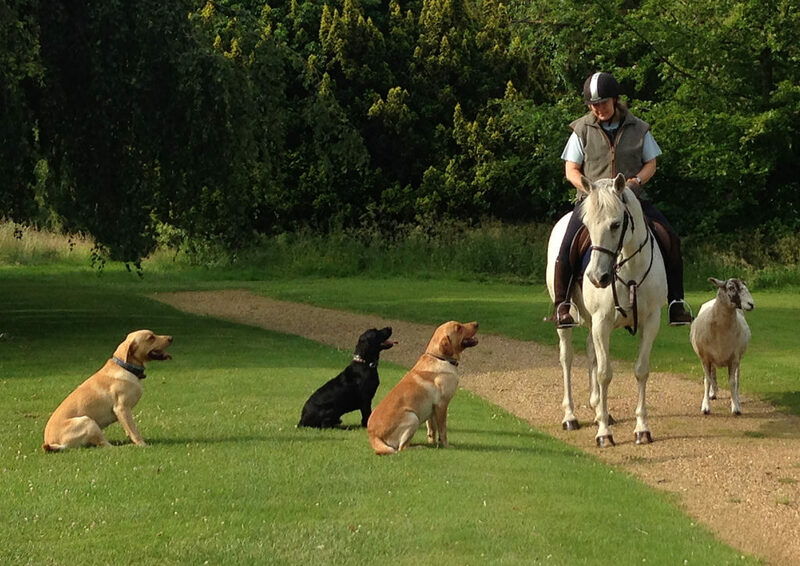 What a wonderful gift in life to ride your dancing Arab mare with the pups, reminds me of the part of Secrets of Highclere where you ride the grounds with the spaniels. So beautiful, so serene, I hope Sheila knows what a lucky sheep she is! Thank you for sharing your delightful home with all of us, I love your books as well! I noticed in the video of you on your Arabian were not posting, I think. I learned to ride Western style in the US where posting is not done. Not good for calf roping! Is the gait of your horse so smoothe it is not necessary? I notice it prances with little steps; was that taught to the horse, or is it natural? Arabs can be quite excited and that is what she is ! Weeds to wildflowers. What a wonderful reminder of God,s creation. And perhaps we should all think of ourselves in this same light. Love your poetic and ‘picture painting’ writing. I could almost smell the fresh mown grass..
Sheila the sheep is now Sheila the video star!! Charming video. Thank you Lady Carnarvon for showing us your precious four footed children. Please show more on future. Thank you, Lady Carnarvon for your weekly posts!!! Your descriptions of everything are poetic and “right on! !” Please keep ’em coming, you make my day! Lady Carnarvon, your blog is a joy to read. Thank you. This one is particularly uplifting. Being an animal lover all my life, I adored seeing Sheila the sheep in the video, and your dogs, and your horse . . . and what a happy field of wildflowers! We in the states can use some pleasant thoughts this week. Sheila the sheep certainly brought smiles to me and made me think of our trip up the Roman road into Scotland many years ago. The sheep in the pastures were a lovely reminder of a simpler time and a lovely respite from my hectic life. What a joy to catch another glimpse into your world. Thank you for sharing and challenging us to stop and enjoy the beauty around us. We have been naming the new rams today – they are all Anglo Saxon kings!!! What a beautiful picture to post with this week’s most interesting blog. I too love wildflowers and was sorry we didn’t have time on our July visit to walk that path. Our drive back to English Bicknor meant we needed to leave by 4:30pm. We hope to be back in the UK in 2 years time, so will look forward to seeing the wildflowers then. Sheila, your beautiful Arab horse and dogs are very much family friends, aren’t they? That video & photo tells it all & is such lovely memory to capture and share. Did you have a good crop of crabapples this year? I gather you were going to have a jelly making session. That must have been great fun. My sister’s tree mysteriously died this year, so I now have to find another supply for next year. We make preserves as gifts for our friends who really look forward to them – so much nicer than most supermarket brands. Thanks again for another inspired blog. The crab apples look good and we have not yet gathered them – I think the quince tree is not very happy so I am going to buy new ones although I will plant them elsewhere. My husband and I were simply awestruck by the beauty of Highclere Castle and the grounds upon which we walked. The love, effort, and time you put into HIghclere was evident all throughout the land. No one can think that you sit on your laurels and enjoy it all without sharing it with the world. Thank you for opening up a house and grounds that most of the world’s population could only dream of seeing, let alone being able to walk amidst its timeless beauty. Thank you for coming here and being part of our blog world! The doggies look out of breath – Sheila the sheep was a wonderful little video she is adorable! – My Mom has a saying ” You are living the life” which we hear quite often, especially from visitors to our beautiful Napa Valley – you have a beautiful place as well – Love your blogs Lady Carnarvon – keep em coming! What a lovely post, Lady Carnarvon. The beautiful photos cheered me up. Thank you! I am glad it did ! Thank you again for sharing your beautiful gardens!I only wish that I could have a great garden like yours.With owning a 1/4 of an acre I don’t have too much of a option to grow a big garden like yours.Again I say please don’t stop blogging about the Highclere castle and it’s grounds, as I truly enjoy reading your blogs. Thank you for the lesson on the flowers. Also enjoyed the pictures of you and the dogs and the short film of you and the sheep. She follows you life a little tail. So precious these little things in life. I find any knowledge I glean about wildflowers fascinating! I am recalling my June visit, but with regrets I didn’t walk that meadow. Next time! Your essays privide beautiful respite in a difficult world. Thank you. Beautiful the way your horse steps so pretty. Is it a particular gait? Lovely to watch. Sheila the sheep is adorable! Great name! I remember you talking about the wildflower garden in an interview several years ago – I’m so pleased to see it’s thriving and successful. 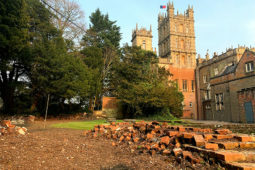 A wonderful added dimension to Highclere. I love reading your blog it gives me hope that there are good people in the world. I live in the US most of the time I live in my car. I lost everything seven years ago after my husband died of stage 4 terminal cancer. I am in my freshman year in College at age 55. Every time I read your blog I think to myself there is a better place out there. Some day I would love to see a High Clere. It seems like a place where you can leave all your baggage at the gate and go back into time. Keep up your great blogs and I will continue going to College so one day I can maybe afford to get there. I am very fond of Sheila, she eats out of my hand and has done very well sharing the horses’ rations! That is another good name for a sheep! 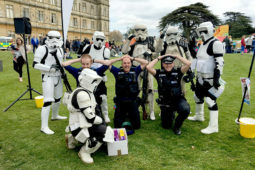 The notification for this posting hit my email yesterday and as I look at it this morning I am reminded of three years ago to the day of my visit to Highclere. My dear friend is a Downton Abbey fan as am I and for her first trip to England we included a day out at Highclere. We thoroughly enjoyed every aspect; the grounds and formal gardens, the beautiful ancient trees, our afternoon tea, and of course the house! My favorite part was walking down the mown section through the middle of the wildflowers. I kept stopping to snap a pic here and there and managed to capture a bee going about its business. Thanks for providing some lovely memories. I loved this walk through Highclere’s wildflower meadows. The flowers are so beautiful, and the gardens are a scene of enchantment. I can only imagine the joy you feel when you traverse the garden on horseback. Dolly seems intent on following you on your rounds. She is so darling as she doggedly tails your every move! It is the cutest sight. No wonder you are in love with Dolly and all your other animal family. 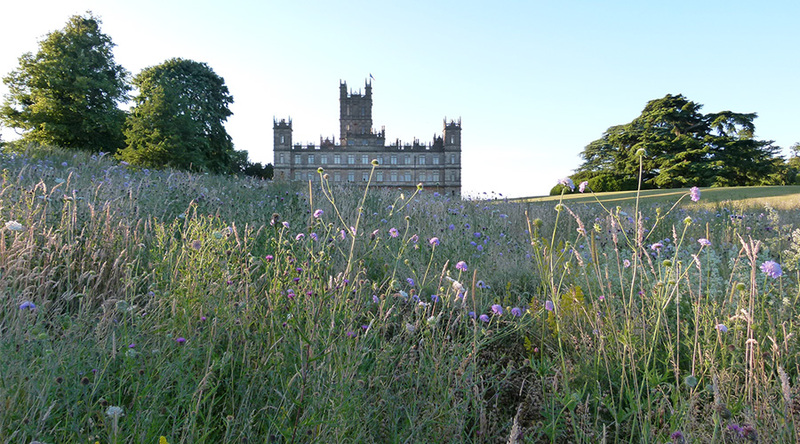 It is lovely to see Highclere beautiful in the resplendent summer sunshine. It brought a little sunshine to my day!!! I love wildflower plots and this time of year they are filled with the delicious hum of approaching autumn. Shadows lengthen and the sun shines a bit gold-like. ‘Tis my favorite time of year. Thanks for sharing your beautiful world with us! Lovely words by Milne. your descriptions are vivid and rather poetic.Love the video of the cavorting of Sheila the sheep. I would like to amend my comments to say that your lovely sheep Sheila is adorable. I know Dolly is the name of a famously cloned sheep. I just want to say that Sheila’s cute personality is TRULY one of a kind. I was dashing off my comments before work this morning and I mistook Sheila’s name. My apologies to a much loved member of the Highclere family! She is truly sweet and I don’t know how I could be thinking Sheila and write Dolly. My advice to fellow bloggers is to let your coffee (or tea) take effect before you post anything!!! I feel like a complete idiot, but I was commenting on your lovely gardens and perhaps their loveliness distracted me. Let’s go with that!!! And the scientific name of plants is write ok!! I love wildflowers too. My sister hikes in the Rocky Mountains, and takes beautiful pictures of them. She knows their names too. Chicory grows where I’m living, just pops up along the roadside in late summer…it’s one of my favorites. What a beautiful blog, always a joy to read as your writing is filled with love of nature, history, and the human spirit! Many thanks, Lady C. I should love to stroll the grounds at Highclere again soon! Sheila the sheep is obviously very taken with you or your horse or both! I wonder if she thinks you are sheep or if she thinks she is a horse. I do not think she thinks she is a sheep!! We, my husband and I in company of 40 other Iowa Public Television travelers, have JUST returned from a glorious 11 days of touring and traveling in Ireland. In many ways it was hard to come home. It is truly beautiful there. Next time I hope we can visit you in your estate, and see your gardens in all their splendor, as several of my new found friends from the trip had been on a previous trip, and done. Sheila appears to be enjoying every aspect of the excursion! I’m just curious, but does she return to sleep with the sheep, or does she prefer to be with the dogs? Your wildflowers are stunning! And what fun to arrange them. I love bringing the outdoors inside.